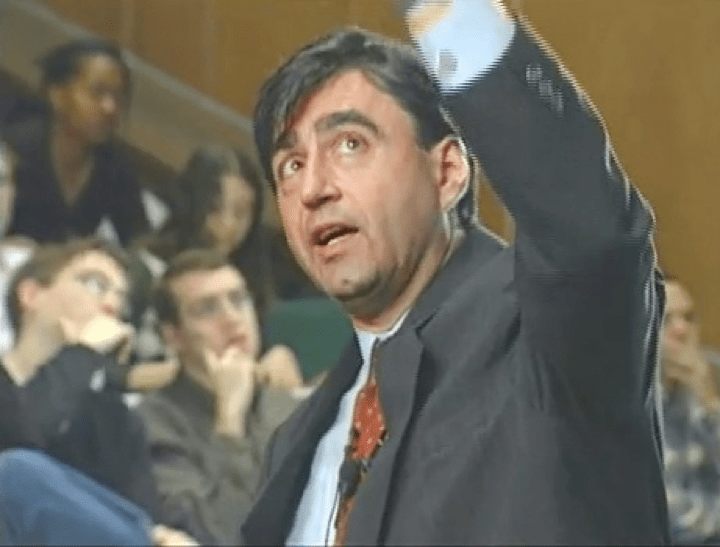 Eric Mazur is a physics professor at Harvard whose energetic, charismatic style has made him a popular teacher for decades. A few years ago, Mazur suddenly renounced his typical lecture/homework/test-based approach and implemented a radically new approach to teaching that he calls Peer Instruction. Why would Mazur take such drastic action to fix something that didn’t appear to be broken? It all started when he read an article by some physics professors at Arizona State reporting that recent graduates of introductory physics courses in college and high school did not appear to understand the fundamental concepts those courses were supposed to teach. The Levi Strauss trademark shows two horses trying to pull apart a pair of pants. Suppose Levi had only one horse and attached the other side of the pants to a fencepost. Using only one horse would: (a) cut the tension on the pants by one-half, (b) not change the tension on the pants at all, (c) double the tension on the pants. 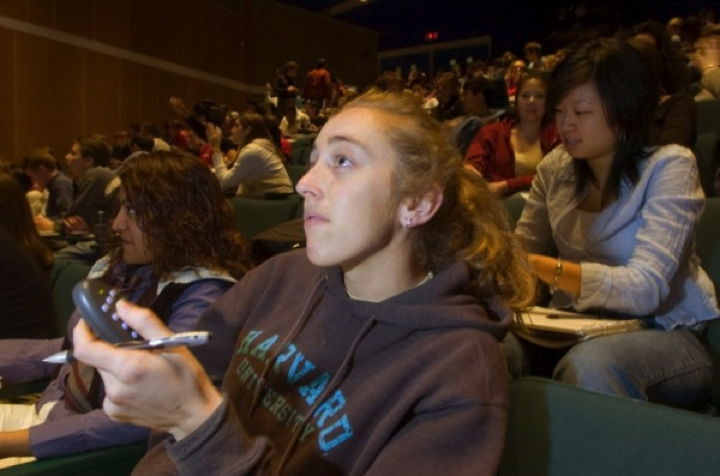 The article reported that intro physics grads in the institutions where the tests were run were unable to answer most of the questions in the inventory correctly. It appeared that the students weren’t actually learning the physics their classes were meant to teach. Mazur’s first reaction was that his students wouldn’t have any such a problem. Just to be sure, though, he decided to run some experiments. In one, he added a question to an exam that was, in effect, a very simple, non-quantitative version of a much more complex standard question on the test. The new problem was so simple that Mazur was almost embarrassed to even put it on the test–somewhat apologetically, he labeled it a “warm up problem.” To his surprise, the problem caused many of his students to melt down. Here’s his colorful description of what happened. Mazur was forced to suddenly confront the fact that a large number of his students were not learning what they were supposed to be learning. Why was that happening, he wondered, and how could he improve the outcomes? His realized, first of all, that simple, qualitative problems like the ones in the force concept inventory required students to confront the actual physical principles being taught in a way that more conventional quantitative problems, which could be answered by applying standard formulas, did not. So he began to organize his class sessions around asking and answering such questions. To help with this, he installed an electronic clicker system, so that each student could “vote” on the answer to each question. He decided to have students vote on each question as soon as they heard it, then discuss the question in class, and finally have students vote again to see how many now understood it. Mazur also realized that his lectures weren’t helping students very much. As he now says, he wouldn’t expect students to learn how to play piano by watching him play, so why would he expect his students to learn physics by watching him do it? So he took the radical step of eliminating his lectures in favor of discussion centered around the problems students were asked to answer. But Mazur discovered that he wasn’t able to help students that much in the discussion. The concepts were so obvious to him he wasn’t able to comprehend how students got the problems wrong, and his sophisticated explanations were too difficult for most students to assimilate and apply. At the same time, Mazur observed that other students in the class, having just worked out the answers to the problems on their own, seemed to be much more effective at helping their fellow students get it too. So Mazur took the really radical step of substituting peer-to-peer discussion for interaction with himself, the instructor. So he finally settle on a method in which students vote on the answer to a problem, then discuss it amongst themselves in small groups, then vote again, at which point usually most of the class will now understand to correct answer. Mazur would then debrief the problem and answer quickly, then move on to the next problem. Mazur’s work has been lumped under the banner of the (excellent) “flip the classroom” approach of Bergmann and Sams, which has come to describe more or less any method in which students study material before coming to the class and then attempt to put what they studied into practice in the classroom, with the instructor coaching instead of lecturing. And that’s fair. But I think that Mazur’s approach has unique features that are well worth studying and emulating, notably the use of clear, focused questions like the force concept inventory to drive learning, and the explicit use of peer-to-peer learning to advance the learning process. Discussion by Mazur and others about this work can be found all over the web, but I think that this video in particular is extremely worthwhile. It’s long, but I highly recommend watching it if you can find the time—it’s a brilliant discussion of educational methodology grounded in very concrete experience. Great post–I wish I could have taken physics like this. Very interesting. A few days ago I was struggling to teach my son how to use heelys (those shoes with wheels). I tried youtube videos, demos, hand holding and everything else. Then, I found another kid who was smoothly using heelys. Viola! my son could now use heelys! I guess this is to do with the differences in how experts and novices codify knowledge and perhaps how adults and children codify knowledge.